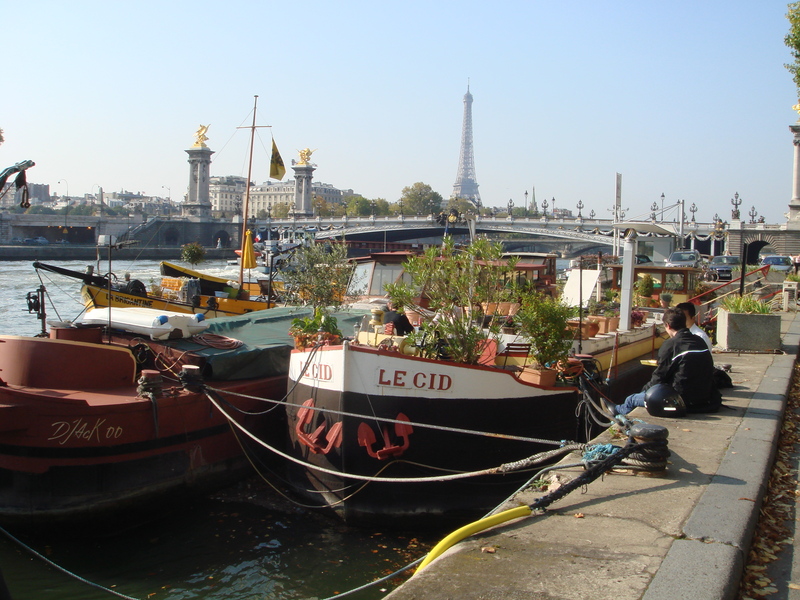 If you can’t get out on the River Seine when you’re Paris, then take a promenade along its banks. La promenade (the walk or stroll) has always been a favourite French leisure activity. La promenade was a feature of Louis XIV, the Sun King’s day. A retinue of courtiers, his gardener Andrea Le Notre and a full orchestra accompanied him as he promenaded the purpose built paths of his grand palace at Versailles. Old French novels, paintings and photographs are full of references and depictions of promenades. 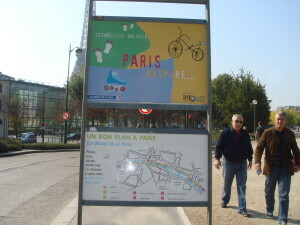 Still now, any lunchtime, evening, weekend or holiday, the streets, allees and riverbanks of Paris teem with promeneurs – families, couples, groups and singles. There have been countless tourists guide books written about picturesque and interesting Paris promenades, guaranteed to keep the visitor safely to a tried and trusted path, with maximum monument, cafe, charm and vista value. But whether you follow a prescribed route or ramble at will, the promenade is the best way to explore this city and most importantly, to see it as it really is. 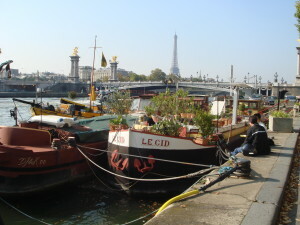 One of the best routes for a Paris promenade is along the River Seine. Life on the river is endlessly fascinating. Barges piled with containers make their way out to the coast. Barge people, lines of washing strung along their decks, wave as they pass on their way up river. Bateaux Mouches cruise slowly by, crowded with tourists, while a disembodied voice counts off the monuments for them. Houseboats bob gently along the banks. On their decks, screened by potted gardens, their occupants lounge in deckchairs. Joggers pant past. A few fishermen doze over motionless lines. Painters dab away at their canvasses against the sunny stone walls. Spanning the Seine are the famous Paris bridges, each quite individual, each with its own story and each definitely worth a detour for a different view of the river. It’s also worth a detour to browse in the Bouquinistes or booksellers’ Seine-side stalls for old editions, comics, magazines and other unexpected treasures. All along the Seine there are famous Paris monuments – the Conciergerie, Notre Dame, the Eiffel Tower, the Louvre and the Musée d’Orsay. There are also many beautiful but unknown Parisian buildings. If you’re strolling the Seine in summer, you might find yourself on Paris Plage, surrounded by bikinis, sandcastles, ball games, the scent of sunscreen and all the trappings of the beach, save the surf and the salt.